Funding Source: Feed the Future Innovation Lab for Nutrition at Tufts University in Boston, MA, supported by USAID. The objective of this prospective cohort study was to investigate the association between maternal aflatoxin exposure during pregnancy and adverse birth outcomes, primarily lower birth weight, in a sample of 220 mother-infant pairs in Mukono district, Uganda. Previous studies have shown that aflatoxin exposure is widespread in both the food supply and population in Uganda. 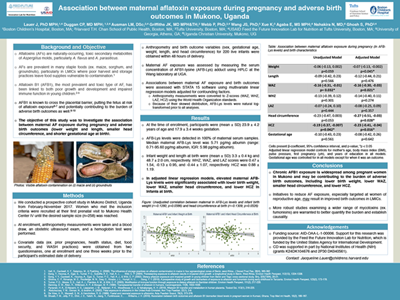 The primary objective of this study was to investigate the association between maternal exposure to aflatoxin during pregnancy and subsequent infant birth weight in Mukono district, Uganda. Secondary outcomes of interest were infant length, weight-for age Z-score (WAZ), weight-for-length Z-score (WLZ), length-for-age Z-score (LAZ), head circumference, head circumference-for-age Z-score, and gestational age at birth. AFB (aflatoxin B)-Lys levels were detected in 100% of maternal serum samples, indicating widespread dietary exposure to AFB1 (aflatoxin B1) of the sample population. Elevated maternal AFB-Lys levels were significantly associated with lower infant birth weight, in addition to lower weight-for age Z-score (WAZ), smaller head circumference, and lower HCZ in infants at birth. Initiatives to reduce aflatoxin exposure, especially targeted at women of reproductive age, may result in improved birth outcomes in low- and middle-income countries. Overall, birth weight is an indicator of maternal health and nutrition status as well as infants’ short-and long-term wellbeing. Infants born low birth weight are at an increased risk of a number of short- and long-term consequences, including neonatal mortality and morbidity, impaired immune function, childhood stunting, reduced cognitive development, and chronic diseases later in life. While previous studies have established that AFB1 can cross the blood brain barrier, to our knowledge this is the first human study to examine the association between maternal aflatoxin exposure during pregnancy and infant head circumference and HCZ (head circumference-for-age Z-scores) at birth. We found a significant negative association, which is particularly noteworthy given the established association between infant head circumference and brain size.